The Kawarau Bridge Bungy (bungee) – home to the original 43 metre Bungy Jump. If you’ve heard of Bungy, you’ve heard of the Kawarau… it is where Bungy founders AJ Hackett and Henry van Ash started it all. 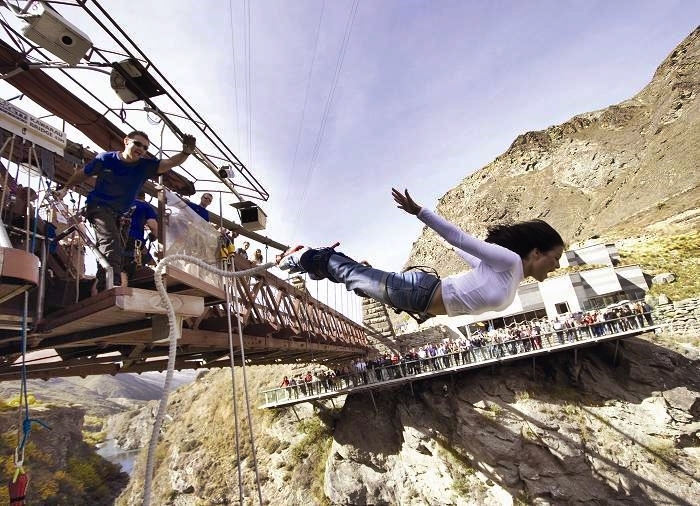 The world’s first and most infamous of leaps is still going strong, with tens of thousands Bungy jumping each year. At the world’s best-loved Bungy site, the choice is yours: tandem or solo, then you can decide whether to bob above the water, touch it, or be fully immersed. • Bob above the water, touch it or get dunked! Self-Drive (allow 1 hour): Located on SH6 in the Gibbson Valley just 20 minutes from Queenstown and 30min from Cromwell. Transportation Included (allow 2.5 hours): Transportation is available from the Station Building on the corner of Camp and Shotover Streets in the centre of Queenstown. Trips depart daily at 9.20am, 12.00pm and 2.40pm. Check-in 30 minutes before departure.